Download DA Form 984-R, also known as the Munitions Surveillance Report. 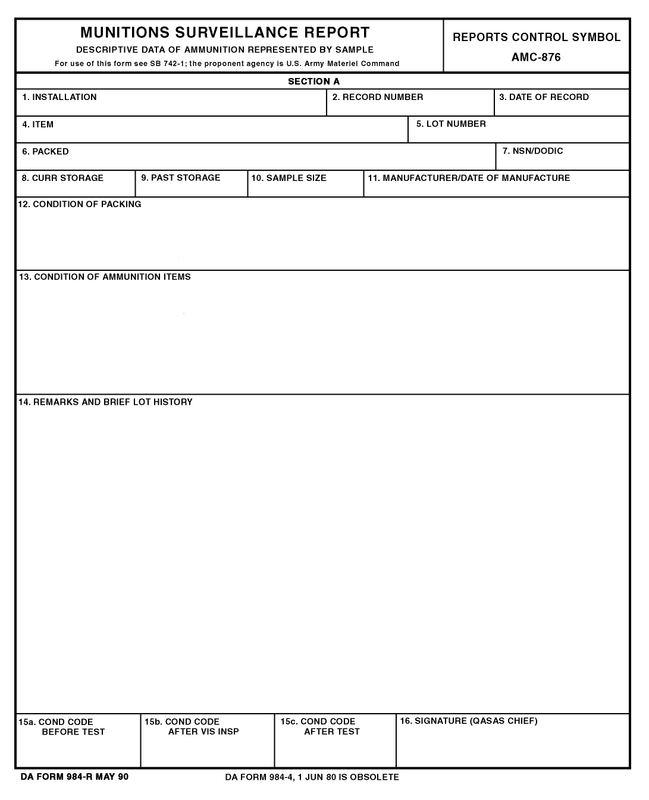 This form is to assist in testing munitions as the enter military possession. It will also track depreciating flaws that the munitions may experience, making it easier to decide if the ammunition is safe and if the munitions should be requisitioned, depending on test results. 9. Component Lot Numbers a. and b. 10. Results – a. through g.
Step 3 – Block 13.- Place any remarks with regard to any of the tested ammunition in block 13. Step 4 – Blocks 14.and 15. These forms are fillable online and/or printable for manual completion and/or sending.